The logs generated by ArcGIS Server come in real handy sometimes when trying to troubleshoot some problems with the server. Also, if you are developer creating custom “Sever Object Extensions (SOE)“, the “ILogSupport” interface provides the facility to add your own custom messages to the ArcGIS Server logs. Since, there is no way to debug the Server Object Extensions (at least I don’t know of any), logging messages from inside the SOE is crucial to be able to debug and troubleshoot the Server Object Extensions both during its development and also after deployment. Viewing the ArcGIS Server log file always used to be a pain in the ‘you know where’ since it was just a huge and constantly growing text file. I used to be using my favorite text editor Notepad++ to read the log file which notified me when the log file changes and updates it automatically. But still that only went so far to take the pain out of viewing the logs. Here is some information that will enable you understand the ArcGIS Server logs better. 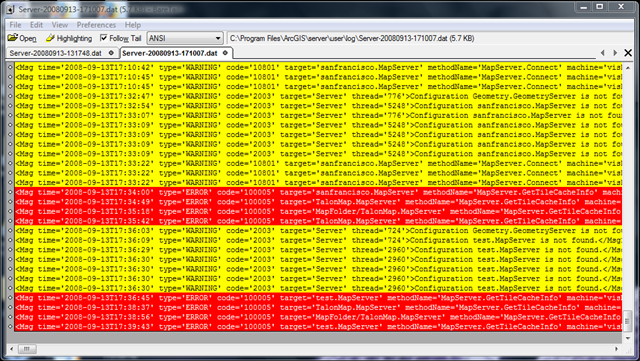 The ArcGIS Server log file can be found under the “C:\program files\arcgis\server\user\log” directory. A new log file is created whenever the ArcSOM service is restarted. This TYPE string in the log message, allows us to highlight the lines in the log file with different colors are shown below. This lets the ArcGIS Server logs to be read so much easier. 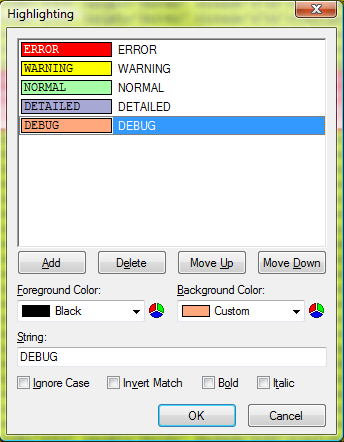 I have saved the color scheme shown above into a configuration file. The configuration file can be downloaded from here. You can import the color scheme directly into your BareTail install and set it to be the default. Being able to read the log files this clearly allowed me to notice errors being logged that I would have never noticed before. For instance, I noticed that every time I previewed a non-cached MapService in ArcCatalog, a “Method Failed.” ERROR (See Below) was being logged when the “MapServer.GetTileCacheInfo” was called. I don’t think calling the “MapServer.GetTileCacheInfo”method for a non-cached MapService should fail and be logged as an ERROR. Not quite sure why this happens on my server but it doesn’t make me feel good about it. BareTail is also a great tool for viewing other log files. If you are using Log4NET to create logs in your applications, BareTail will come in real handy for viewing those log files also. I will actually be using Log4NET to log messages from my Server Object Extensions instead of using the ArcGIS Server log files which will allow me to concentrate only on the messages logged by my component.